In the first week of July a long season peaked for The A-Team with the Swedish roller derby championships in Sundsvall and a fourth place. Having ended fourth in the two prior championships the goal this year was to finally get that bronze medal. Throughout the season the team has been focused on this goal by increasing both on- and off skates training, physical as well as psychological. Although it didn’t last all the way the A-Team showed great improvement, bettering their result against the reigning bronze medallists Dock City Rollers. 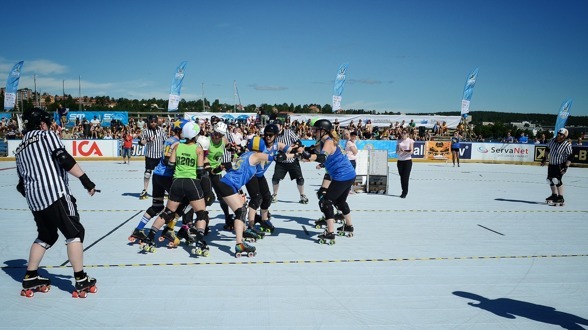 Last time the two teams from Gothenburg played each other Dock City Rollers won by 258 points. At the Swedish championships they defended their medal but this time only with a margin of 75 points. During the first period of the game the scores were even with lots of lead changes. Dock City Rollers pulled away towards the end of the first period and left Gothenburg Roller Derby unable to catch up. – We came fourth again, but it is OK, because we feel like we have won. We went there as a team, we played as a team and we lost as a team. This year we have developed at rocket speed, more than any other team, said Die Mauer, blocker for The A-Team after the championships. Gothenburg Roller Derby also played Stockholm Roller Derby Allstars in the semi final. Stockholm Roller Derby, which is one of the highest ranked teams in the world, won by 365-40. They later went on to win the championships for the third year in a row. Gothenburg Roller Derby would like to thank everyone who made the Swedish championships in Sundsvall possible: volunteers, NSO:s, referees, skaters, the audience and last but definitely not least the organisers. 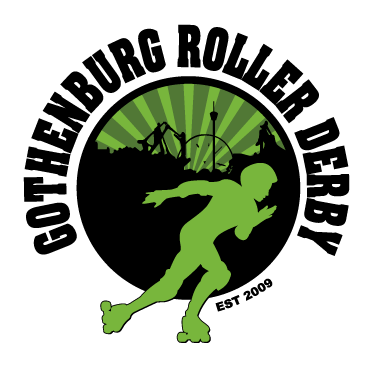 We would also like to congratulate Stockholm Roller Derby on their win, Crime City Rollers on their second place and Dock City Rollers on their third place. Lastly we congratulate The Royal Army on their win in Division 1 and welcome them to Elitserien. We look forward to playing you soon. We also look forward to meeting Luleå roller derby who defended their spot for the upcoming season. A few weeks of derby vacation awaits and in the end of August the draft of next season’s A-Team will be held. They will play the first game of the season against Barcelona in October, which will also be Gothenburg Roller Derby’s first WFTDA game.